University Recreation fosters an environment where student staff can achieve their academic and professional goals. Following the 2018 fall semester, the 318 students employed by University Recreation had an average fall GPA of 3.34 and an average cumulative GPA of 3.37. Seventy-eight of those employees had a 4.0 GPA for the fall semester; one hundred and seventy-six had a fall GPA of 3.5 or higher. Not only are UREC’s student employees performing well academically, they are taking advantage of the full co-curricular professional development experience that the department offers. A job at UREC affords an opportunity to gain a meaningful connection to campus, that can make it easier for students to stay and finish their degree. University Recreation also provides programs and services for its student staff members that optimize student learning and leadership while promoting the personal and professional development of students. Since offering programs that focus on student success, UREC has seen a positive contribution to the overall student experience. Twenty-nine students have completed UREC University, a program that aids in leadership and professional development. Another 192 attendees have attended Brain Food events, a program that aims to improve and enhance life skills such as clean eating, budgeting, self-care, and resume creation. At the beginning of the spring semester, UREC hosted a department-wide training with breakout sessions designed to address the top ten attributes employers look for in candidates, according to the National Association of Colleges and Employers Job Outlook Report. Attributes include communication, ability to work in a team, initiative, and problem-solving skills. 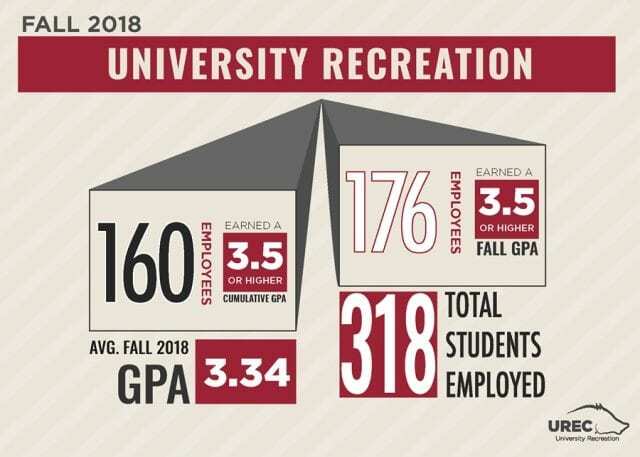 UREC employs over 450 students annually in a variety of program areas. Employment with UREC provides an opportunity to gain valuable experience working within their area of interest, with the possibility for advancement within the department. Benefits of UREC employment include competitive pay, flexible scheduling, leadership development, free CPR First Aid/AED certification, and a free small locker and towel service. All available positions are posted on jobs.uark.edu.